MarsEdit 4.1 is now available for download from the MarsEdit home page and from the Mac App Store. This update brings a variety of improvements and bug fixes, with an emphasis on issues affecting image formats and the preservation, or removal, of metadata on images that are uploaded by MarsEdit. Now there are three choices for image metadata: Preserve All, Remove All, and Remove Location. The right choice will depend on your scenario: if you’re writing under a pen name on an anonymous blog, removing everything is probably the right choice. If you’re a pro photographer and want the detailed camera settings, copyright, etc., to remain intact, then you probably want to preserve everything. But many of you will undoubtedly choose the compromise option, to preserve almost everything, but remove location information that could inadvertently reveal sensitive information to your blog’s readers. While I was “under the hood,” so to speak, I took a look at another detail of image file formats: the color model. Most images formats support the specification of a standard by which the image’s colors should be interpreted when displaying them on a screen. The color model information allows for different devices to handle an image consistently. The sRGB color model is considered the standard for web images, but images from your phone or camera are liable to have another more proprietary color model. Starting with MarsEdit 4.1 there are two options for color model: convert to sRGB, or leave the color model just as it is. 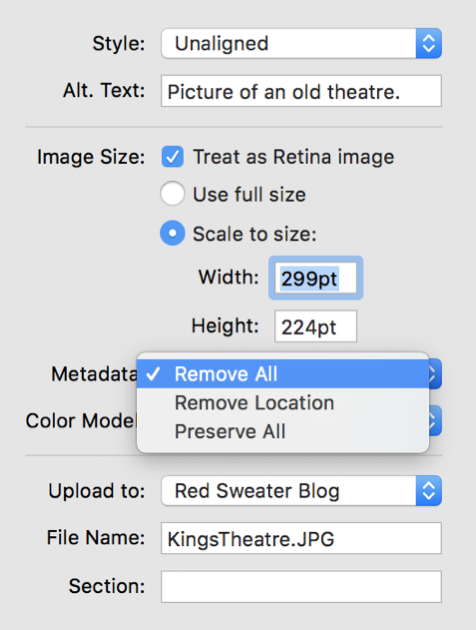 These options for color model and image metadata apply consistently whether your image settings specify a resize, or not. This consistency of behavior will be a very welcome change in MarsEdit 4.1! Also in the image department, MarsEdit now supports dragging photos directly from Apple’s Photos app. You may have noticed that many apps on the Mac do not supports this, and it’s because of a novel approach to dragging that Photos uses. Because images in your Photos collection may be stored in the cloud, a drag from the app only offers a “promise” of a full copy of the image. For this reason apps such as MarsEdit needed to be revised to support the new kind of drag. You might notice when dragging that there is sometimes a delay after releasing the drag. This is because MarsEdit needs to request a “fulfillment of the promise” before it can work with the image.